You know that feeling where you want to sit down, kick off your shoes and let someone else get on and do the work? Impossible, right? … We all know there is only a few of us to go round. Well, after one too many dispiriting meetings our little Transition St Albans group decided to give this new approach a go…. There is a lot of debate about how to engage the mainstream with climate change issues. Transition’s message is positive and community focused, but can have challenges in taking its message further afield. The Climate Outreach https://climateoutreach.org/ project co-founded by George Marshall states their mission is ‘to engage people with climate change from their perspective – not ours’. The Climate Psychology Alliance http://www.climatepsychologyalliance.org/ also grapples with this issue exploring the use of psychological and psychotherapeutic tools to ‘contribute to the difficult task of getting people to engage with the unthinkable’. Sustainable St Albans Week www.sustainablestalbans.org – a Transition St Albans initiative – does make steps to get the mainstream to engage with climate change – but we came at it, not from science, but from necessity, borne out of our personal motivations about climate change; tiredness and frustration that we couldn’t get more people on board. 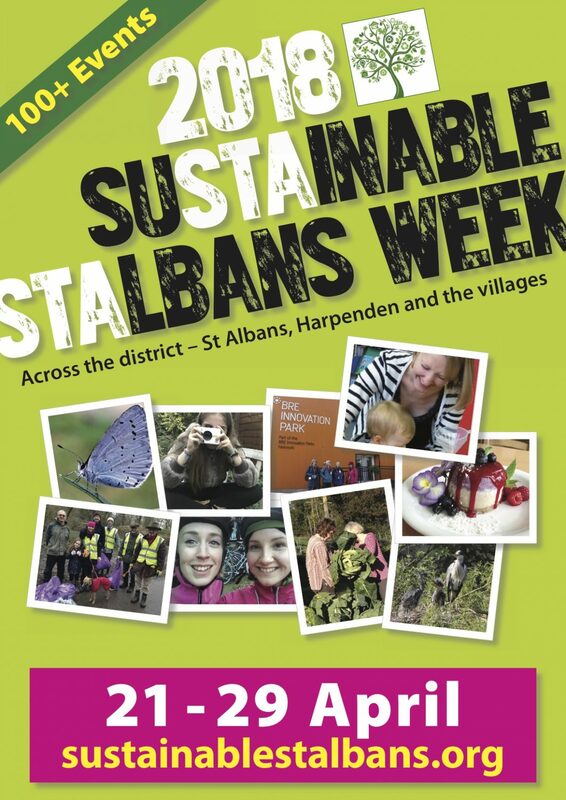 Sustainable St Albans Week is an award-winning week now running for the third year with 100+ activities and events run by local groups – community, business, faith and schools – all about environmental sustainability. But it’s not easy to explain its emergence. As a common or garden member of my local Transition group since 2012, I understand the ups and downs of small-scale community initiatives. Like many we were a small group of around 6 people, working very hard: we had set up a successful Transition Streets programme, volunteers ran a brilliant Open Food Gardens programme every summer, and we also put on monthly meetings with speakers and films and workshops – from local consultations to electric cars. Previously, the biggest ‘up’ for me was helping to kick-start FoodSmiles St Albans http://www.foodsmilesstalbans.org.uk/ in 2012 – now a successful independent community food-growing project. The biggest down was the exhausted feeling of our Transition group in 2015 after the umpteenth meeting attended by the same (wonderful) 12 people, after we had put in an enormous amount of work for one of our regular monthly open gatherings. I couldn’t have believed that three years later our work would involve over 140 local groups – community, business, faith and schools, and engage over 2,000 local people in our shared movement to create a more environmentally sustainable world. At that difficult meeting three years ago we were lucky that a new member turned up. Alan George, who had been a group consultant, was quietly listening to us when he said “It sounds like you’ve had enough of doing all the work yourselves”. In that sweet, unlikely moment, a new vision was born – where we stepped to one side – and decided to change our focus from running our own events to inspiring and co-ordinating activities and events run by other people. We would create a platform for our local community to build a more environmentally sustainable district – a vision that ultimately belonged to them. Of course, there was still a lot of work to do – but this time with renewed vision and the eventual rewards were much more than we bargained for! We formed an organising group, partnered up with our local Friends of the Earth http://www.stalbansfoe.org/ and invited groups from our shared networks to run an activity related to a theme of environmental sustainability during one week in November. 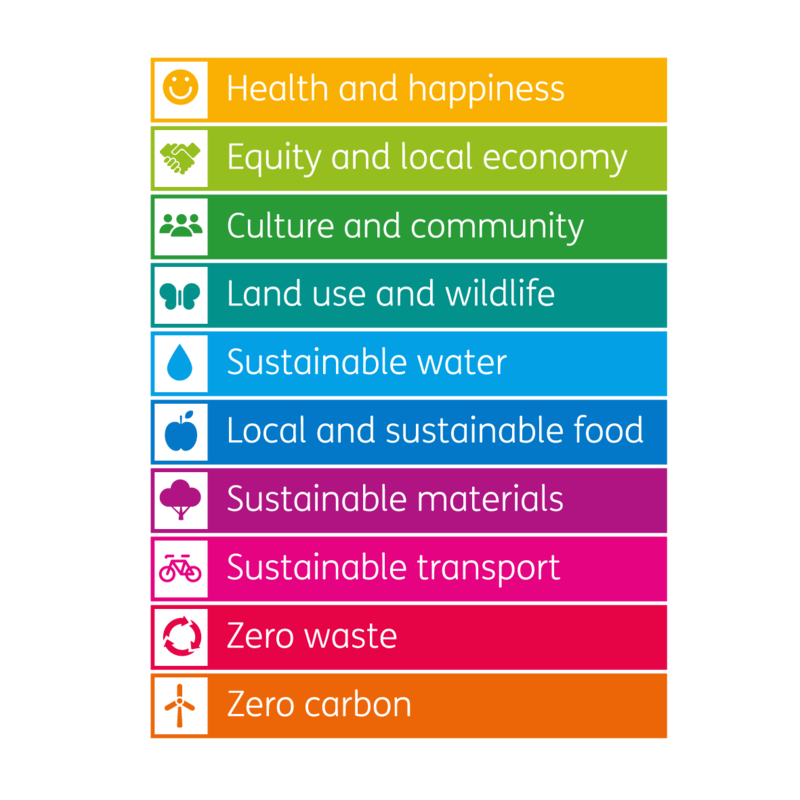 We sought permission from Bioregional to use their One Planet Living framework, an easy way to communicate the issues– from culture and happiness, natural habitats to zero carbon. Sustainable St Albans Week began. 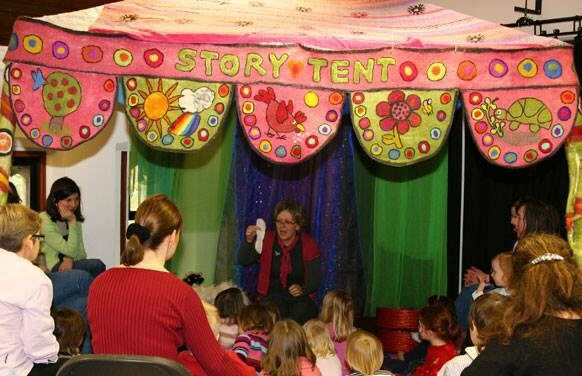 In the first year the Big Lottery https://www.biglotteryfund.org.uk/funding/programmes/national-lottery-awards-for-all-england funded two part-time staff, and with our 8 volunteers we aimed to engage 30 groups. 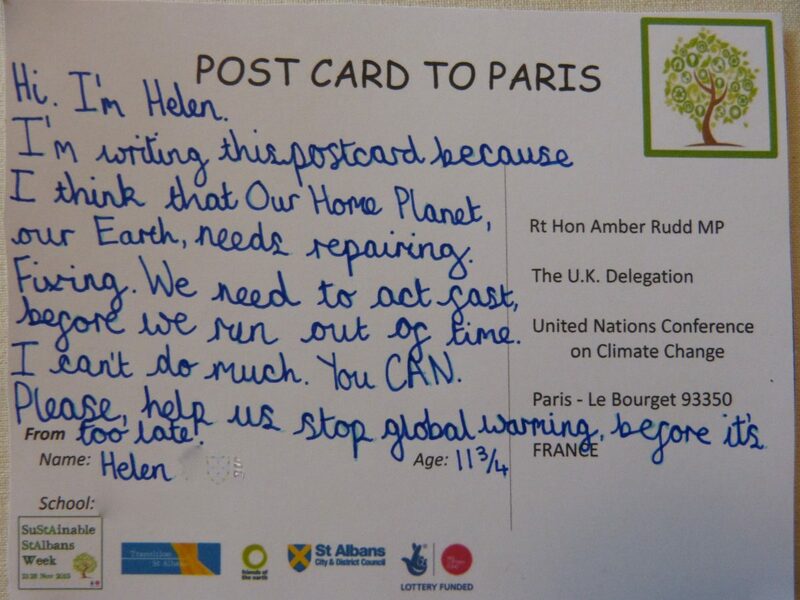 We were overwhelmed when over 100 groups took part, with 2,000 schoolchildren creating our “Postcards to Paris’ https://sustainablestalbans.org/postcards-to-paris/ challenge with sacks full of postcards we handed to Amber Rudd at the Paris Climate Change Conference. "I think we all volunteer because we can see what needs doing, we care about it, and we know it isn't going to get done otherwise! I'm happy to give up my time because Sustainable St Albans Week feels so purposeful; we're having a real impact locally. I've gradually changed things about the way I live because of my involvement, like cycling more, cutting out meat, and trying to reduce the waste our family creates. I know SSA's work encourages lots of other people to make similar changes"
Catherine Ross, chair of Sustainable St Albans Week organising group. 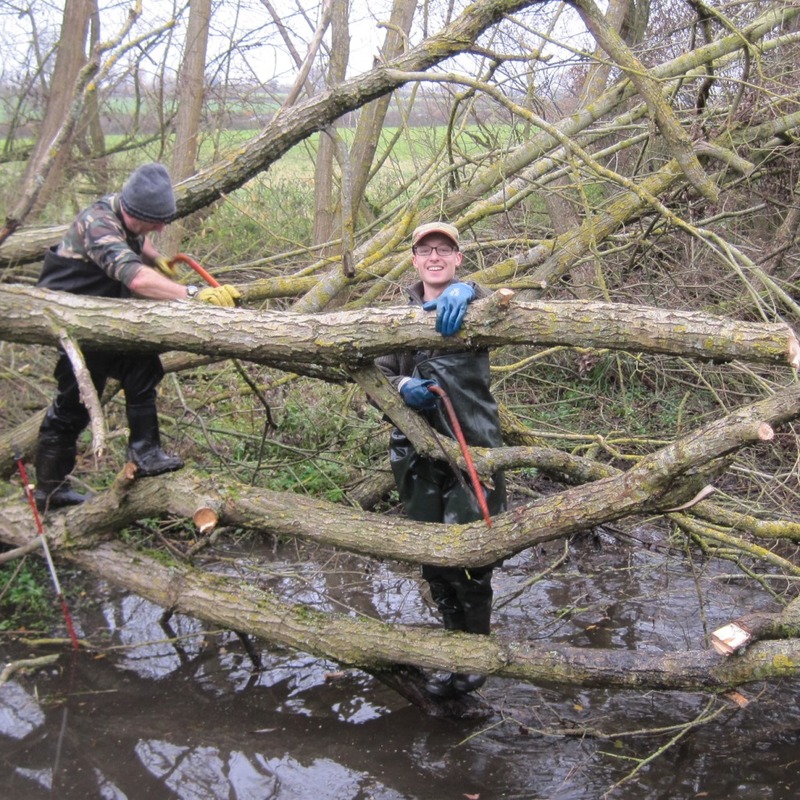 During the next three years a variety of groups – from RSPB’s ’Heron Watch’ to the Asian Women’s Group Open Herb Garden – have run a wide array of events; each related to the work they already did. Groups get the opportunity to promote their own amazing work across a wider audience, and are motivated to develop their thinking around the themes of sustainable living. We created a website, did the publicity https://twitter.com/SustWeek18 , co-ordinated the Week. Our network of organising groups proved to be the key to spreading the word. 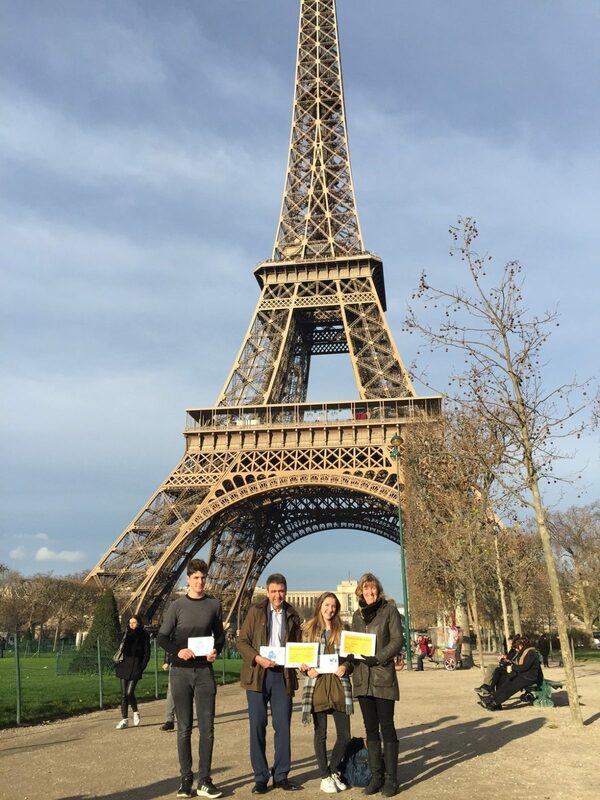 We created side events – from Postcards to Paris to the Community Food Waste Challenge. https://sustainablestalbans.org/foodwaste-challenge/ This year we run the Know How Festival with practical ideas for living sustainably, and Our Planet, Our Future – talks with seriously sustainable speakers. Plastic Free St Albans launches during the Week, and there is a children’s photography competition– with nearly 100 entries so far! A local church may organise a ‘walk to church week’; or school-children create a model of a sustainable city; Oaklands College Art and Design students are running Slam Junk –catching all the college’s plastic bottles through a basketball net! There are bike rides and water information sessions, free tours of the food waste recycling unit. Businesses run promotions with Charlie’s Coffee doing a discount on her reusable cups, Camphill café serving a local food menu. 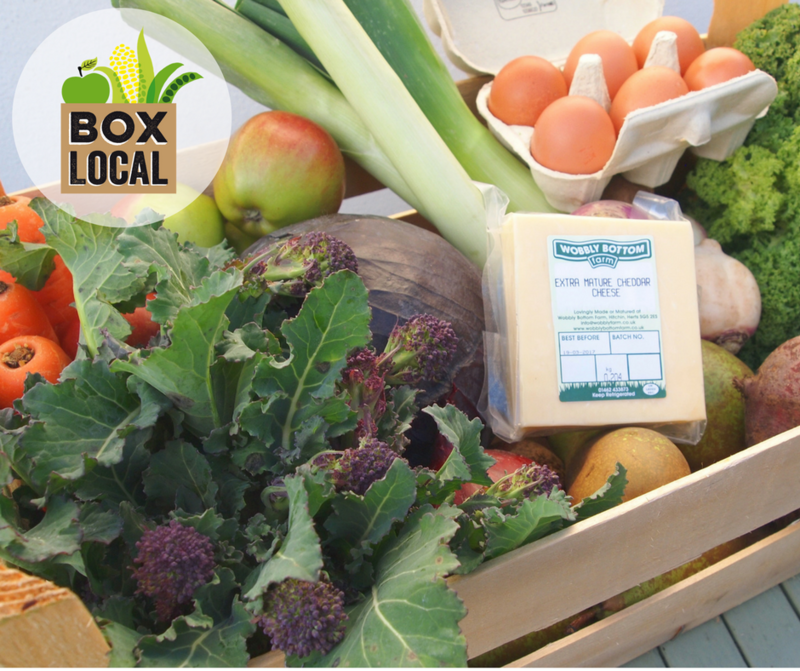 Harpenden Town Council is running Shop Local and the Green Kitchen doing a vegan cookery class. Just wanted to say personal thanks for yesterday- it was amazing! Not only did it ignite passion in my pupils for sustainability, it also did the same for me as an adult! It has taken some learning to understand how to work with business, as most of us have public sector or charitable professional backgrounds. We encourage businesses to run events, and also to sponsor us! This year we have found significant new sponsorship from local businesses with an interest in sustainable issues including Green Energy, AECOM, Lussmanns Restaurants, JPA Furniture, Godfrey’s Fish and Chips and Veolia. Our big Community Sponsors are Rothamsted Research, which sponsors and hosts our Launch Event; BRE which have an event at their Innovation Park around sustainable housing development, and Just Energy Solutions who have been brilliant helping to communicate the Week. There are a lot of people out there who care deeply about the environment, and who love to build community – but don’t have a collective voice. The Week provides that voice locally and helps raise the profile of climate change and helps to create a positive future vision across our district. But one week can’t do it all. One comment from the 2015 evaluation summed up our challenge: “Some people just came and had a nice time, whereas what you want is deep and meaningful change”. Other community groups a few miles away have successfully created community renewable energy projects, http://www.hertfordenergynow.org.uk/ which literally reduce carbon emissions – perhaps our Week is just a fancy PR job? Perhaps… but regardless of what we think, the Week now seems to have a life of its own. We also hold collaboration and network events with groups enthusiastic to come together to share, learn and make connections. Amanda Yorwerth from St Albans Friends of the Earth believes that long lasting partnerships have been created through the Week. With the environment, everything is connected and interdependent. Groups are not really dealing with separate issues. Our Friends of the Earth group has made new connections through the Week especially with the local cycling campaign, which now helps us with our work on Clean Air. Ruby Raut, a local environmentalist who helped with the Community Food Waste initiative in 2016 went on to successfully bid for funding from Sainsbury’s Love Food, Waste Less project and has been running her Food Waste Ninjas https://foodwasteninjas.wordpress.com/ project across 12 schools this year. Plastic Free St Albans https://plasticfreestalbans.org.uk/ was partly inspired by A Plastic Ocean screening we organised at St Albans Film Festival. St Albans District Council provides support from their Sustainability Officer. In our third year Harpenden Town Council is also a key supporter. Local councillors gave support from their locality grants. Gail Jackson – with help from the group. Sustainable St Albans organising group: Catherine Ross (chair), Gail Jackson, Amanda Yorwerth, Sheila Wright, Caroline Wilkins, Lesley Flowers. Paid: Susheel Rao – co-ordinator, Sophia Barrett (Harpenden Town Council communications contract), Danny Smith – communications. Plus more volunteers! We would be happy to talk to other groups about how we set this up – but please wait until after 29th April! See our website sustainablestalbans.org to contact us.